What species are we looking at here and what condition? What treatment would you suggest? 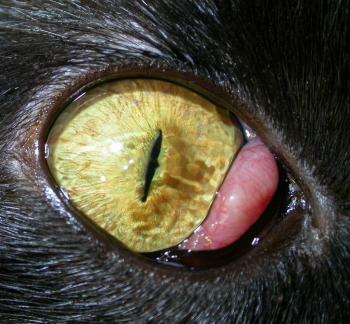 This is a cat with a prolapsed nictitans gland, a so-called cherry eye. While not unheard-of (see Chahory et al Three cases of prolapse of the nictitans gland in cats. 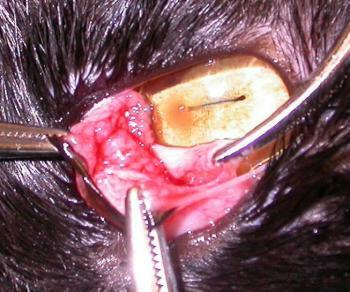 Vet Ophthalmol. 2004;7:417-9 and three other papers suggesting a breed predisposition of the Burmese) the condition is seen much more commonly in the dog. As in that species, replacement, here using the mucosal pocket technique is advisable. This entry was posted in Cases and tagged cat, Prolapsed nictitans gland. Bookmark the permalink.